The Fellowship was fortunate enough to obtain a copy of NEGATIVE SPACE #1 from Dark Horse Comics. Ryan K Lindsay writes and Owen Gieni draws and colors. Guy is sick of his life and is ready to kill himself. The only thing stopping him is writer’s block – he can’t decide what to put in his suicide note. So he takes a walk to clear his head. But Kindred is ready for him, and their field agents do everything they can to keep him on the edge. Kindred is a company that mines negative emotions, and Guy is one of their best sources. And their pushing is working, at least until Guy stumbles across something he wasn’t meant to see. It’s really easy to feel bad for Guy, which is exactly the point. This first issue goes a long way to build that feeling of pity, as well as the sense of conspiracy that Kindred brings. Woody adds a different angle to the whole thing, too. And the cliffhanger does a beautiful job of not giving any hints about what comes next. The art goes a long way toward setting the mood, with the coloring and Guy’s look specifically. It would be hard not to be pulling for Guy in this story, but it looks like he’s got an awful lot going against him. Check it out, though, and we can always hope. 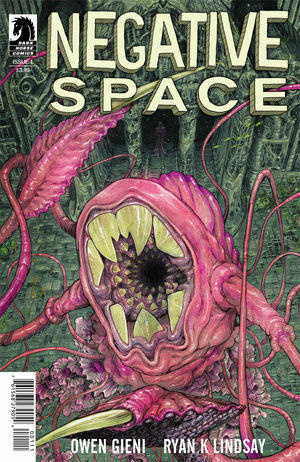 NEGATIVE SPACE #1 is available now at your FLCS or at darkhorse.com.